Federal law requires tire manufacturers to place standardized information on the sidewall of all tires. This information identifies and describes the fundamental characteristics of the tire and also provides the tire identification number (TIN) for safety standard certification. The TIN can be used to identify the tire in case of a recall. P: The “P” indicates the tire is designed for passenger vehicles (not all tires have this information). Three-digit number (215): This number gives the width in millimeters of the tire from sidewall edge to sidewall edge. Two-digit number (65): This number, known as the aspect ratio, gives the tire’s ratio of height to width. R: The “R” stands for radial. Two-digit number (15): This number is the wheel or rim diameter in inches. Two- or three-digit number (95): This number is the tire’s load index. It is a measurement of how much weight each tire can support. You may not find this information on all tires because it is not required by law. H: Tire speed rating. You should not drive the vehicle faster than the tire speed rating. DOT: Abbreviation for the “Department Of Transportation”. 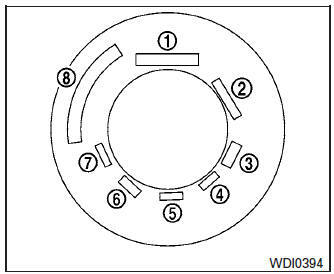 The symbol can be placed above, below or to the left or right of the Tire Identification Number. Two-digit code: Manufacturer’s identification mark. Three-digit code: Tire type code (Optional). Four numbers represent the week and year the tire was built. For example, the numbers 3103 means the 31st week of 2003. If these numbers are missing then look on the other sidewall of the tire. The number of layers or plies of rubbercoated fabric in the tire. Tire manufacturers also must indicate the materials in the tire, which include steel, nylon, polyester and others. This number is the greatest amount of air pressure that should be put in the tire. Do not exceed the maximum permissible inflation pressure. Indicates whether the tire requires an inner tube (“tube type”) or not (“tubeless”). The word “radial” is shown if the tire has radial structure. In addition to the many terms that are defined throughout this section, Intended Outboard Sidewall is (1) the sidewall that contains a whitewall, bears white lettering or bears manufacturer, brand, and/or model name molding that is higher or deeper than the same molding on the other sidewall of the tire, or (2) the outward facing sidewall of an asymmetrical tire that has a particular side that must always face outward when mounted on a vehicle.